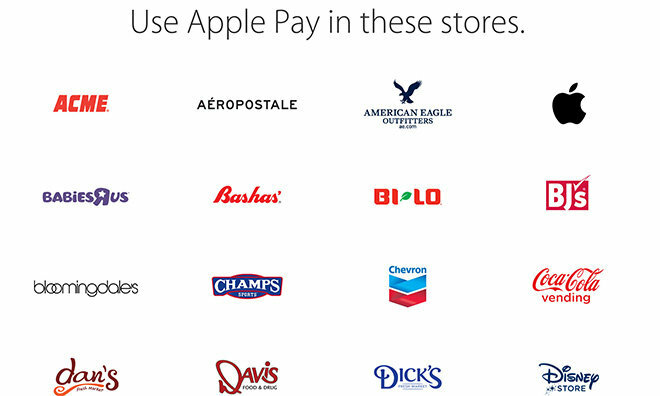 Apple on Wednesday updated its "Where to use Apple Pay" webpage, adding a total of ten new merchants to an ongoing list of retailers that accept the company's branded NFC-based mobile payments system [updated]. Customers can now use Apple Pay at Acme, Davis Food & Drug, Firehouse Subs, Gamestop, Luby's, Rubio's and T-Mobile locations. In addition to retail stores, Apple also notes NBA fans can use their iPhone 6 or 6 Plus —or come April 24, Apple Watch —to buy official team gear at three arenas. In all, there are 68 featured merchants spotlighted on Apple's page, though there are many more around the U.S. who accept Apple Pay through contactless payment terminals. It was already known that Amway Center, home to the Orlando Magic, and the Golden State Warriors' Oracle Arena supported Apple Pay transactions. In fact, SVP of Internet Software and Services Eddy Cue explained Apple Watch's Apple Pay capabilities to journalists at Oracle Arena last month. The Phoenix Suns' US Airways Center was added to the list today. Upcoming merchants expected to roll out Apple Pay point-of-sale terminals in the near future include Carmike Cinemas and Raley's. On the digital side, Apple Pay's list of featured apps that support in-app purchases grew by one with apartment search app RadPad. Apple last updated its Apple Pay compatibility webpage in March when it added Jamba Juice, Office Max and 12 other supporting merchants.